Editor's Note: We are updating this story after Danny Lee made the first hole-in-one in the 2018-19 PGA Tour season. It was our intention to put together a story recognizing the first known hole-in-one in golf history by Young Tom Morris. While compiling information for the post, we ran into a snag. Through research, we found conflicting dates as to when the hole-in-one actually occurred. Some publications referenced the 1868 Open Championship at Prestwick (including the World Golf Hall of Fame website), while others had it as the 1869 Open, also at Prestwick. Looking to get to the bottom of this achievement, we put in an inquiry to the fine folks at Prestwick in Scotland, hoping we could clear it up. It took a few days before our inquiry made it to the proper person, but we're happy to report we nailed down the date. The Young Tom Morris ace happened on the 166-yard, par-3, eighth hole -- the "Station Hole" -- on Prestwick's original 12-hole course in the first round of the Open Championship, played on Sept. 16, 1869. Interestingly, if you look in the top-right corner, you'll see that the original year -- 1869 -- is crossed out and "1868" was written in. There's an explanation for that, Goodwin told us. "For a long time there was a lot of confusion about which year Young Tom had a hole-in-one in the Open with various publications giving conflicting dates," Goodwin wrote in an email. 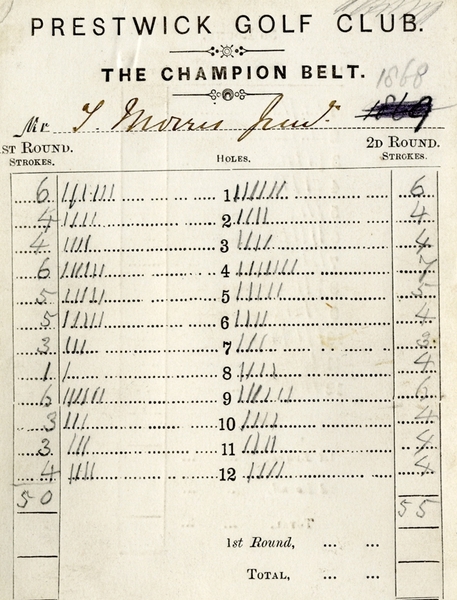 "There was even some confusion at the Club in the 1930s when the scorecards were collated with the 1869 date being changed to 1868, but the newspaper report from the local press in 1869 definitely confirms that 1869 was the correct year." If there's one thing we know -- and love -- about Scottish links courses, it's that typically not a whole lot has changed on them in the last 100+ years, with the exception of extending from the original 12 holes to 18 holes. So, we wondered, could any one of us take a crack at that same par-3 hole today where Morris made his ace? As it turns out, the answer is "no." "The Prestwick course was extended to 18 holes in 1882," Goodwin said, "only three of the original holes were retained and the old eighth hole was removed, so no longer exists." Young Tom Morris, 18 years old at the time, would go on to win that Open Championship at Prestwick -- the 10th played -- by nine shots over runner-up Bob Kirk. Young Tom's father, Old Tom Morris, finished in sixth-place, 23 shots behind his son. The field consisted of just 14 players. It was the second of four consecutive Open Championship wins for Young Tom Morris (he won in 1868, '69, '70 and '72 -- the tournament was not played in 1871). A year earlier, he became the youngest champion in tournament history at age 17 -- a record that stands to this day. So, there you have it. To set the record straight, the Young Tom Morris hole-in-one -- the first known ace in the game's history -- happened on Sept. 16, 1869.